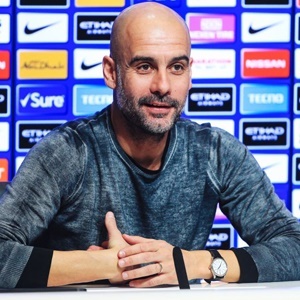 Manchester - Pep Guardiola admits Manchester City's bid for an unprecedented quadruple will be defined by Wednesday's Champions League showdown with Tottenham and their following two Premier League games. Guardiola's side are in contention to win all four major trophies after lifting the League Cup, reaching the FA Cup final and staying in touch with Premier League leaders Liverpool. City's next obstacle on the road to football immortality comes in the Champions League quarter-final second leg against Tottenham as they bid to overturn a 1-0 deficit at the Etihad Stadium. Even if they beat Tottenham to make the semi-finals, there will be no time for City to rest on their laurels as they face Spurs again in the Premier League on Saturday before heading to Manchester United the following Wednesday. "Definitely. If we don't win these games we will be out of two competitions. I've had this feeling for weeks," Guardiola told reporters on Tuesday. "Last season in this period we were already champions. This season we had an incredible opponent in the Premier League with Liverpool. Both teams deserve to be champions, but just one is going to get it. "After what we did last season, I'm surprised that we have 83 points right now. The target is 98, without that we will not be champions. "Tottenham are incredible and we don't have rest. We played nine, 10 or 11 games more than Liverpool. Even with that, I like this challenge." Having won the Premier League in record-breaking fashion last season, Guardiola could have been forgiven for focusing on Europe this term as he looks to win the Champions League for the third time as a boss - and the first since his 2011 triumph with Barcelona. And Guardiola, who cut a tetchy figure for much of his press conference, refused to accept he has underachieved in Europe's elite club competition. "Do I have to win it? No. The chairman said I have to win the Champions League three times in a row! "I didn't come here to win the Champions League honestly. I came here to play the way we played the last 20 months. Guardiola's grumpy mood included a rant at the Premier League for failing to give English teams in Europe equal treatment. "They had six days to prepare the first game, we had two. Now they played Saturday, we played Sunday," Guardiola said. "I don't know why the Premier League don't put the games at 12.30 on Saturday." Guardiola's irritability may have been provoked by a question about his past jibe that Tottenham were the 'Harry Kane team' in reference to the England captain's importance. Kane will miss the second leg with ankle ligament damage sustained against City last week, but Guardiola wasn't going to give Mauricio Pochettino's side any extra motivational fuel. "Tottenham without Kane are the same strong team they had three seasons ago, two seasons ago and this season," he said. Guardiola knows Tottenham will pose a serious threat to City's quadruple dreams over the next few days, and he called on the Etihad crowd to produce an intimidating atmosphere. "I know how focused the players are, I know the desire to get to the semi-finals," he said. "Every time we played away in the Champions League the atmosphere was incredible, so we need it. "I want to see if our fans really want to get to the semi-finals."